Factory BMW intake systems are well known to be very efficient. 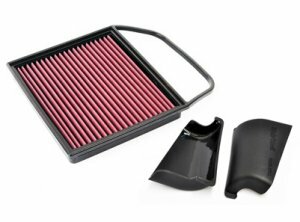 The Macht Schnell Intake Charge Scoops (ICS) assist in air delivery by diverting cold, fresh air from behind the kidney grilles into the airbox, with a noticeable power gain found at higher speeds on vehicles equipped with our High Performance Filters. The ICS pieces are constructed from nearly indestructible polyethylene, which prevents heatsoak and will not bend, distort or rust after years of use. The inside of the ICS pieces have a smooth radius with a gloss finish to direct airflow into the intake snorkel while the outer edged are black textured to emulate factory pieces, giving a stealth appearance.